Where Is Milton GA ? The City of Milton has a zip code 30004. This Zip code is shared with the Northern area of Alpharetta as well. Not to confuse you, this is Fulton County and when you cross the Milton boarder into Cherokee County. The mailing address is considered Alpharetta and the zip code is 30004 as well. 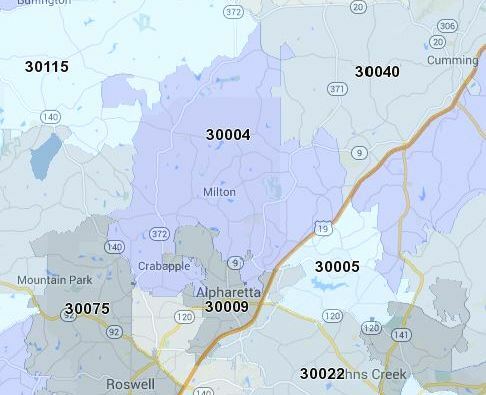 If you take a look at the attached North Atlanta 30004 Zip Code Map, you can see a faint line going East to West above Milton. This is the line separating Fulton from Cherokee County. Not to confuse, but the same thing happens on the East side of North Fulton Milton. Areas of Forsyth County also share the 30004, City of Alpharetta address and that also is a faint line on the map. For resources to help you navigate Real Estate for sale in Milton, I wanted to break the areas in a resource list. Enjoy!